Sweet Citrus: How to Avoid a Sour Experience. Today, I will be hiding out in the greenhouse. Don't tell anyone. I'll be there, with my trusty guard cat, Oreo, pretending to work, potting up my green babies. In actuality, I'm just avoiding the inevitable. The Master Gardener police will be arriving any moment to revoke my membership. It wasn't intentional, I promise. There was no premeditation, no plan to off an ugly specimen to make way for a new, lovely purchase. If I'm guilty of anything, I loved my plants to death. Last spring, I succumbed to temptation. (Isn't that how these sad stories always begin?) The desire to test my gardening mettle proved too great, and I obsessed with growing citrus for my family. Citrus. In our zone 7b garden. Foolish, you say—and you're correct. But I had a plan. In my mind, lovely containers of dwarf lemon, orange, and clementine trees, heavy with fruit and smelling of bliss, could easily move from garden to greenhouse when the weather proved too chilly. I would nurture them, baby them, and then feed my family heavenly doses of healthy vitamin C, grown with a mother's love. All went well...for awhile. The six citrus trees thrived in the South Carolina heat with barely a pest in sight. When my friend Libby mentioned she was eating homegrown oranges in Charleston, I barely registered jealousy—knowing that soon we, too, would feast on deliciousness. As the fall days turned shorter and cooler, I moved the containers into the greenhouse to avoid frost. And there they sat, patiently waiting for spring. I visited them, inspecting for pests, checking their health, but letting them rest, too. Stunning, divine blooms began appearing on one of the orange trees. Another began sporting tiny buds. I became obsessed with sniffing their scent, watching as miraculously blooms began opening and filling the greenhouse with fragrance. Until this point, the greenhouse remained unheated. But seedling season began, and as soon as the tiny green babies began showing their heads, I turned the propane on full-throttle to a toasty 75 degrees. Suddenly, one morning as I watered the seedlings, I heard strange noises. Fearing a furry critter resided in the greenhouse, I turned around and watched in horror as leaves dropped, one by one, into huge piles beneath each citrus tree's container. My first reaction, of course, was to cover up the crime. Had I forgotten to water? Quick, let's give them a good drenching. Was it time to fertilize? Not sure, but let's add some organic Dr. Earth citrus tree nutrients. And then let's water a little more. Gone were the beautiful blooms, filled with potential. The tiny buds dropped, unopened, into the mounds of leaves. Only thorny remnants remained to mock me. As any decent gardener knows, extreme shifts in temperature will adversely affect the plant. Ironically, less than two weeks ago, I lectured a class full of organic gardeners about the need to harden-off seedlings. Why did I think my citrus trees could handle the cold of an unheated greenhouse one day, and then bask happily in permanent 75 degrees? Of course they were going to revolt. Oh, really? Sheesh. What was I thinking? So, yes, I claim complete responsibility for my poor leafless, bloom-less sticks. However, the charges against me might change to reckless endangerment rather than murder. Apparently, the lovely people at Four Winds Growers anticipate distraught gardeners who've potentially murdered their plants. 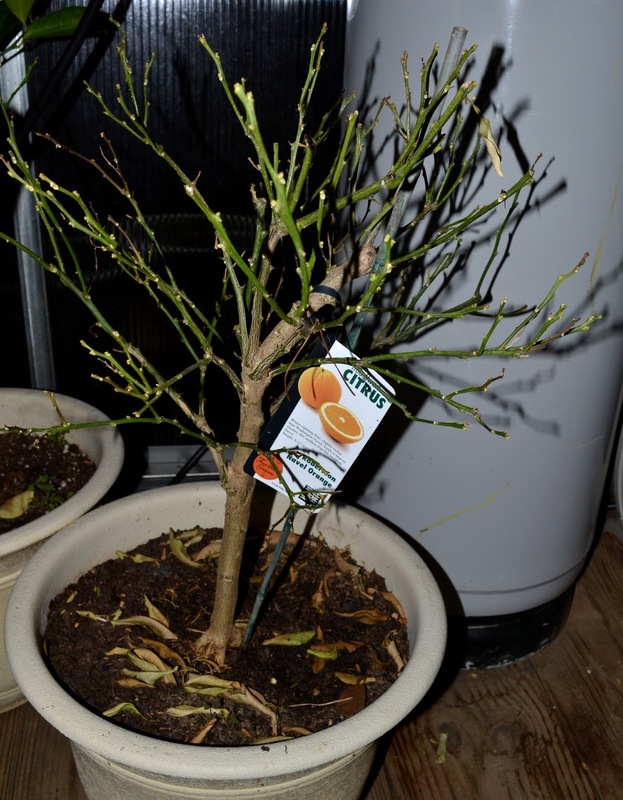 They kindly tell us that a naked citrus tree doesn't necessarily spell its demise. By lightly pruning it back, new growth might be encouraged to appear. As part of my penance, I thought I'd share some of the tips provided by Four Winds Growers to help you avoid my painful path. Growing citrus should be a pleasure, not a crime. Order trees from a reputable source. Dwarf varieties are grafted onto rootstock that maintain the tree's smaller size, which makes them perfect for containers. And containers mean that you can grow citrus, even if your zone says not—just bring the plant inside...slowly. Use a container that's twice the size of the root ball, and make certain it has good drainage. Fill the container with a slightly acidic, loam-based potting soil that allows good water flow. You don't want to use heavy garden soil, which can compact and cause root rot. Site the plant so that it receives 8-12 hours of sun. Provide regular watering, but keep the plant drier in winter to avoid root rot. Citrus trees like moist air, which can be accomplished by using a humidifier or misting. Fertilize every three weeks in spring and summer with a high nitrogen organic fertilizer for citrus trees. In fall and winter, fertilize every six weeks. Move plants indoors before frost, slowly acclimating them to indoor conditions. Likewise, carefully acclimate the plants to the outdoors in spring, first positioning the plant in partial shade, later moving to full sun to avoid shocking the plant and scorching leaves. Watch for signs of pests or disease. Yellow foliage can indicate lack of fertilizer or over-watering, and some leaf drop is normal in hot summer months. However, monitor for severe problems to ensure the plant's health. By following instructions and not murdering your plants, you can expect fruit and flowers on 2-3 year old dwarf trees. Harvest time varies, depending on the variety. Most lemons and limes require 6-9 months from bloom to edible fruit, while oranges take up to a year for harvest. Now, you're ready to grow your own citrus. I hope the Master Gardener police will let me off with a warning, as I've shared my shame as part of my rehabilitation. I'm off to prune the trees, hoping to push that new growth. One day, we will grow our own citrus. Until then, thank goodness for The Orange Shop at LocalHarvest.